THIS 2018 Jeep Wrangler Unlimited HAS GONE THROUGH A 110 POINT SAFETY INSPECTION BY OUR A.S.E CERTIFIED MECHANIC! 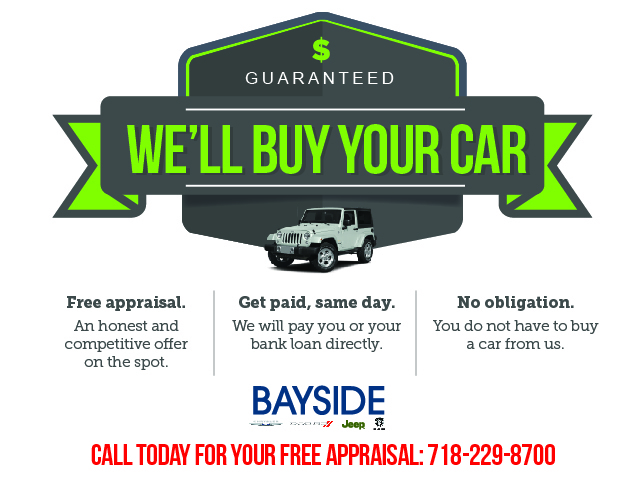 Bayside Chrysler Jeep Dodge Ram is Family owned and operated and has been selling cars nationwide for over 35 years! We provide plenty of pictures and full descriptions of our vehicles so there should be no questions about the condition of the vehicle. Contact Bayside Chrysler Jeep Dodge today for information on dozens of vehicles like this 2018 Jeep Wrangler Unlimited Sport S.
Your buying risks are reduced thanks to a CARFAX BuyBack Guarantee. On almost any road condition, this Jeep Wrangler Unlimited Sport S offers solid performance, reliability, and comfort. Simply put, this Four Wheel Drive is engineered with higher standards. Enjoy improved steering, superior acceleration, and increased stability and safety while driving this 4WD Jeep Wrangler Unlimited Sport S. Look no further, you have found exactly what you've been looking for. Don't hesitate to contact Bayside Chrysler Jeep Dodge. This Jeep Wrangler Unlimited won't last long. At Bayside Chrysler Jeep Dodge, we strive to provide you with the best quality vehicles for the lowest possible price, and this Wrangler Unlimited is no exception.